Cake maker Prestatyn, birthday cakes delivered Rhyl, cupcake deliveries Deeside , gluten free, dairy free, sugar free. At sweet Lillys we are dedicated to the creation of that perfect celebration and Wedding cake not only for the way it looks but by the way it tastes. Being fully registered with our local council and insured creating quality birthday cakes, cupcakes, Birthday cakes and cakes for all occasions. We source the finest ingredients for our cakes. We do not compromise on flavour. 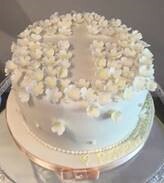 We also make cakes for people with differing dietary needs - gluten free, dairy free and sugar free. Please indicate at checkout if you have a special requirement. All prices include delivery, being based in prestatyn we cover, Rhyl, Deeside and surrounding areas.